The Little Things this week is a little mix of things from the last couple of weeks. From delicious meals I’ve made myself to what I’ve been watching and listening to, here is everything that has made me happy in the last little while. Fresh Meat | After my British sitcom splurge last week I’m onto another one: Fresh Meat! I love Jack Whitehall’s work and Fresh Meat is definitely one of his best. I love the play on student stereotypes as they are so true (if a little exaggerated) and it is hilarious. I think Kingsley’s storyline in the fourth season where he realises his degree might not be that relevant for what he wants to do in life which I think is a struggle I’m definitely going to face. Coffee Catch Up | I love going for coffee so when one of my friends texted asking if I wanted to grab a coffee I was very there for that. Our other friend joined us whilst we there and we all had a good catch up and giggle over flat whites and milkshakes. We went to the local iCafe, which whilst it isn’t the best café in the world, the coffee isn’t bad and it’s not that expensive. Peanut Butter Tofu Satay| In my week of overwhelming boredom I have done a lot of cooking. I was a bit unsure about what to do with my tofu that would make it delicious I whipped up a little peanut butter satay to eat with noodles. I just whacked in some honey, peanut butter, chopped garlic and onions and soy sauce and then adding this mixture to the stir-fried tofu. It was freaking delicious. 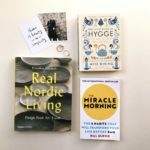 Goal Digger Podcast| On a morning twitter scroll I saw a tweet from Victoria about Jenna Kutcher’s Goal Digger podcast. I’m on a podcast roll at the moment so was intrigued and I adore it. I love Jenna’s chatty hosting style and I always feel so inspired after listening to it. It has really opened my eyes to a lot of female American creatives that I had never heard of before and I love sitting down to do blog work with Jenna and her guest chatting in the background. The Library| I have joined the library. And it is amazing! I had a library membership in Kelso when I was in primary school but fell out of the system as I got older. As I’m trying to live frugally at the moment and can’t really be pouring my money into Amazon orders on books joining the library felt natural. 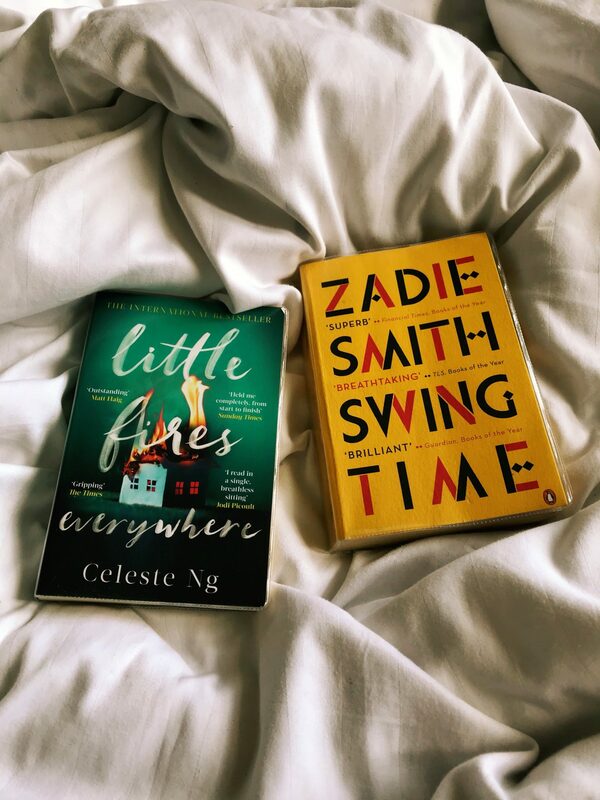 I was really inspired by Hayley sharing the books she was picking up from the library in the US on Instagram and I’m in a real reading mood at the moment. 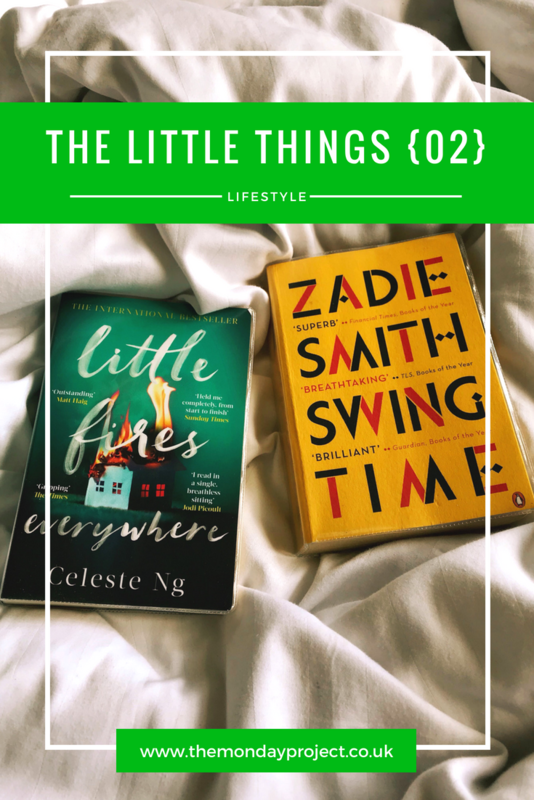 I joined Glasgow Libraries, headed to my local and picked up a few books including the pictured Little Fires Everywhere and Swing Time.. Honestly can’t believe this incredible system is FREE. Singl-end Working Brunch| I am constantly inspired by my gal Charlotte who does all the cool stuff and we met up for a little working brunch on Tuesday past in Singl-end. 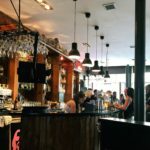 We went to the new one in Merchant City and it is just as lovely as the original. I smashed through my to do list, had delicious porridge and a cake, and a dreamy apple juice. It was nice to get out the flat and sit behind my screen in a different location with fab company too. Primark Pyjama Bottoms| For a while I felt guilty about spending money on new pyjamas but considering how much wear I get out of them I’ve re-visualised my mind-set. I bought a pair of Coca Cola print pyjama bottoms a few years ago from Primark that I adore to this day but they are very old and worn with a few holes in them now. To replace these, I picked up a gorgeous pair from Primark which have a blue print on them and they have pockets. Pockets! They are the softer pyjamas I’ve ever bought from Primark and I’ve literally had to peel them off myself to go in the wash.
Fika At Ikea| You cannot beat a trip to Ikea and whilst Rachel and I were doing some browsing for nothing in particular we saw that between 2 and 5 you can get any hot drink and any cake for £1.50. I’m sorry but this is the best thing I’ve ever come across. The coffee alone costs £1.50 usually and the cake I chose would normally be £1.95. After having a lovely time browsing a little lemon meringue cake does not go amiss. New Plants!| Since moving rooms I have loved sprucing things up, rearranging my things and just having a real homely feel. Buying a new plant was the one thing I wanted to definitely buy in Ikea and I am now the proud owner of two new plants including an aloe vera plant. Owning one of those has been a goal for a while now and well, I’ve done it. This brings my plant family up to a total six members now which I’m very proud of. Planning | I’ve been using my page-a-day diary since about February of this year to mainly write to do lists in but I honestly couldn’t imagine life without it at the moment. I’ve taken to writing any important appointments, deadlines and things I’m doing that day at the top and then splitting the page into AM and PM. I find this streamlines my day a lot better and I don’t end up putting unrealistic tasks on and then feeling sad when I don’t get everything done that I have written down. This new approach is just really helping me stay motivated and inspired. Office Sandals| Consider me influenced by Charlotte as when I saw her wearing these black Office sandals I dashed out and bought my own pair a week later. I am absolutely in love with them. Super comfortable, really versatile and are a fantastic dupe for Birkenstocks if you don’t fancy splashing out. I also got 10% off as well with my student discount which is always nice.